Battery is mounted non the stem. The HF radio is in the pouch hanging from the handlebar. The ham stick is behind the seat by the flag. I’ve been an amateur radio operator for a few years. My goal, back in 1989 when I first earned my license was to put a side-band station on the air that generated a kilowatt carrier. During those subsequent year I’ve tried many of the available digital modes. But none of them, with exception of Packet, caught my interest like that of the old tried and tested Morse code. Eventually, I abandoned my quest for the 1,000 Watt station and went the other way – low power, or QRP. 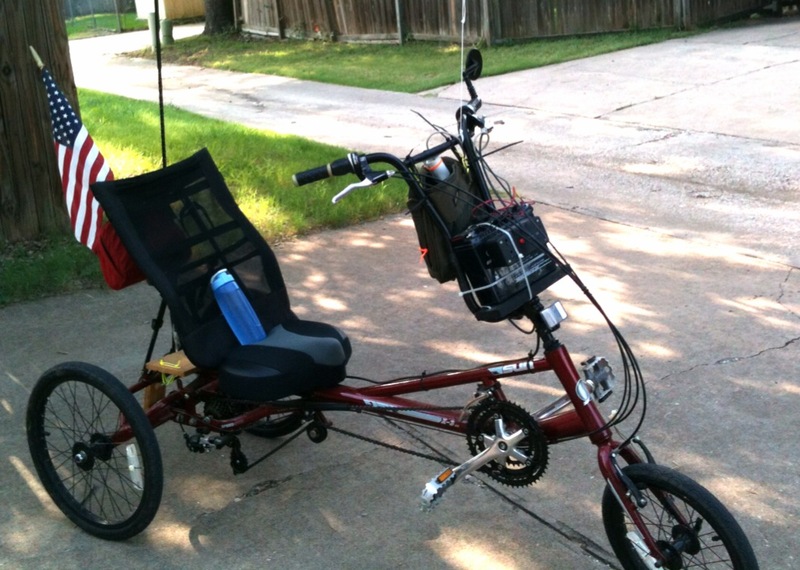 For a few years I concentrated on mobile radio, not with a car, but with a bicycle, and then a tricycle. I’m not a pioneer of this area, by any stretch. And I probably haven’t done as well as many others have. But I’ve had fun. A lot of fun. One afternoon while pedaling around some Texas back roads with my five-Watt rig (about the same power required to light a Christmas tree lamp), I checked in with the Maritime Net. The net control was somewhere in Wisconsin, as I recall. I received a fair signal report – a home-run considering the power I was using. I was preparing to sign when a Musher, a lady who drives sled dogs, broke in from North Dakota, stating she’d like to talk with a person on a bike. That was my greatest distance with 5 Watts from the eat of a bicycle and a store-bought ham stick antenna. Have you tried Summit on the Air (SOTA). North American has a strong representation in the SOTA program. SOTA encourages radio amateurs to use QRP. The program promotes physical exercise and outdoor activity. I haven’t. I too old to try it now.